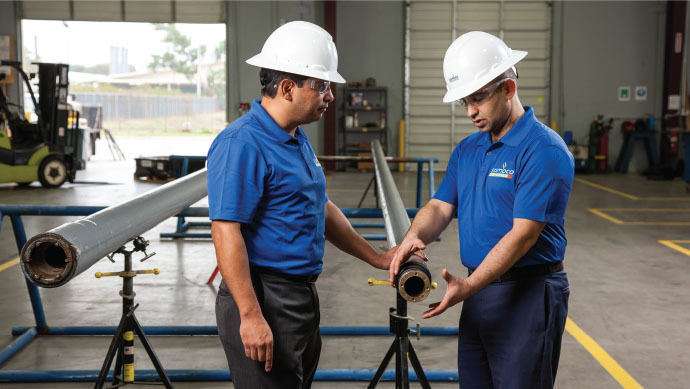 As operators and regulators place greater emphasis on well safety, the oilfield service and supply sector has been working to develop new technologies and business relationships that can help enhance and improve well control and integrity. Over the past few years, much of the focus on this front has been on new offshore blowout preventer (BOP) systems and designs, and a number of new technologies have been introduced to meet the requirements and challenges posed by ultra-deepwater, highpressure/high-temperature reservoirs. When it comes to ultra-deep high-pressure and high-temperature drilling, some operators and drilling contractors are finding that not only are new designs and concepts needed, but new business models as well. One of the more notable collaborations has been the contractual service agreement (CSA) reached by Diamond Offshore Drilling, Inc. and GE Oil & Gas, to develop a new blowout preventer service model that could be applied to the entire industry. The essence of the CSA is that it transfers full accountability for BOP performance to GE Oil & Gas (now BHGE). In this "pressure control by the hour" model, Diamond Offshore will compensate GE Oil & Gas only when the BOP is available. This 10-year collaborative arrangement for GE’s engageDrilling Services showcases a new way of thinking to drive continuous improvement in deepwater drilling. Under the terms of the arrangement reached in 2016, GE purchased the BOP systems aboard Diamond Offshore’s four drillships for a total of $210 million. "Subsea equipment repair and maintenance is the single largest cause of nonproductive time across our industry, resulting in great expense to both drillers and operators," said Marc Edwards, President and CEO of Diamond Offshore at the time of the agreement. "In today’s market, we have to make the economics of offshore drilling more competitive for our clients. The purpose of our new Pressure Control by the Hour service model is to incentivize all parties to prioritize equipment reliability and availability for the ultimate benefit of our customers." "To deliver a solution that improves drilling efficiency now and in the future, collaboration is essential," said Lorenzo Simonelli, President and CEO, GE Oil & Gas, at the time of the announcement. "We are changing the game by building the new blowout preventer service model for the industry. With improved control, maintenance and servicing of our equipment, we are putting skin in the game and guaranteeing performance." GE Oil & Gas says that its engageDrilling Services offering enhances BOP system availability by transferring the maintenance and service of pressure control equipment to GE Oil & Gas. This includes on-rig GE Oil & Gas personnel, management of parts, overhaul and repair, continuous certification, data monitoring, and management of change. This new arrangement is a performance-based alliance that leverages the scale of GE data, predictive analytics, insights and continuous certification, positioning GE as a long-term commercial, operational and technical partner. 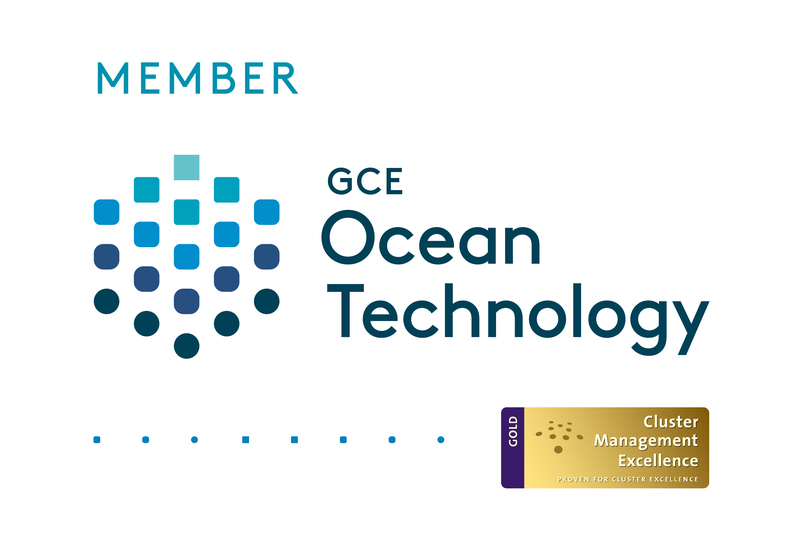 Under the new service model, Diamond Offshore will begin capturing data through GE’s monitoring and analytics solutions. Over time, this will enable condition-based monitoring and maintenance, which the companies say will drive proactive decision-making and planning to address the requirements of industry standards for drilling systems. By transferring the maintenance and service of well control equipment to GE Oil & Gas, Diamond Offshore says it is simplifying operations and optimizing between well maintenance to reduce the frequency and duration of downtime. Noble Corp. has developed an electrically powered BOP ram design that it says reduces system complexity and offers increased reliability. The company’s electrically operated blowout preventer design features an electrically operated shear ram that could close with a 2 million-lb force at any water depth, without the use of hydraulic power. A simplified control system would be used to safely drive the ram, without discharging any fluid to the marine environment. Key features of the BOP are its simplified mechanical design, new battery technology, and a gas boost that allows the equipment to achieve the 2 million-lb closing force. Noble says it believes that this technology has the potential to be a catalyst for innovation and, with further development, could become the standard for future subsea BOP designs. Although electrical alternatives to BOPs have been suggested before by others in the industry, Noble’s goal was to develop a technology with reduced system complexity, including a simpler control system, that would yield improved reliability and accuracy in ram movement. Noble says that the BOP features a significant reduction in the number of components compared with hydraulic BOPs – it has only 131 parts in total, of which only 17 are unique to the design. Further, the drive and charging systems have no moving parts. These achievements were enabled partly by combining several structural pieces into larger modules. The BOP features a decentralized control system, which can be interfaced with ROVs in multiple ways. The subsea hydraulic accumulators are replaced with batteries, and the conventional open-loop system – where hydraulic fluid can be released into the environment after activation – is eliminated, Noble says. In March 2017, Noble showcased the results of its work with a live demonstration at its training facility in Sugar Land, Texas. A prototype of the BOP successfully sheared a 6 5/8-in. 5135 27-lb/ft drill pipe during the demo event. Subsequent testing featured the successful shearing of 6 5/8-in. 5135 40lb/ft drillpipe and 7-1/4-in. OD tool joint, which required more than 2 MM lbs of closing force. For the next phase of the project, Noble says it is planning to collaborate with an original equipment manufacturer, classification authorities and interested operating companies. The final choice of the BOP’s system layout will require input from these partners to ensure a proper path to market. Noble also says that it remains fully committed to its core business of offshore drilling, and has no interest in entering the BOP business as a manufacturer. Instead, the goal is to provide an alternative technology to current BOP designs and to work with the industry to commercialize the new BOP design. Other companies are also looking to develop their own electrically controlled BOP designs and managed pressure drilling technologies. Akastor subsidiary MHWirth and Norwegian company Electrical Subsea & Drilling (ESD) recently formed a technology partnership to cooperate on BOP design and management. ESD is working on development and qualification of all-electric control of BOPs and a durable rotating control device for managed pressure drilling. Over the past few years, MHWirth has developed new well barrier technology for BOPs, which it has now transferred to ESD in exchange for a 20% share in the company. 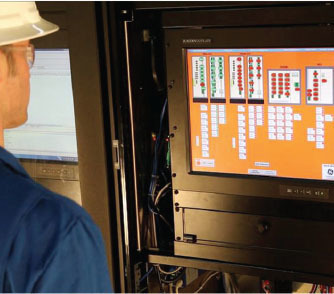 BHGE says that its SeaONYX surface control system utilizes mission-critical SCADA technologies to improve BOP system uptime and reduce the challenges of system obsolescence management. Since 2010, ESD has been working on its all-electric BOP concept that it says will make drilling safer and much more cost-effective. The core components of the technology are electro-mechanical actuators, integrated with well barrier utilities, and a new control system including condition-based monitoring. 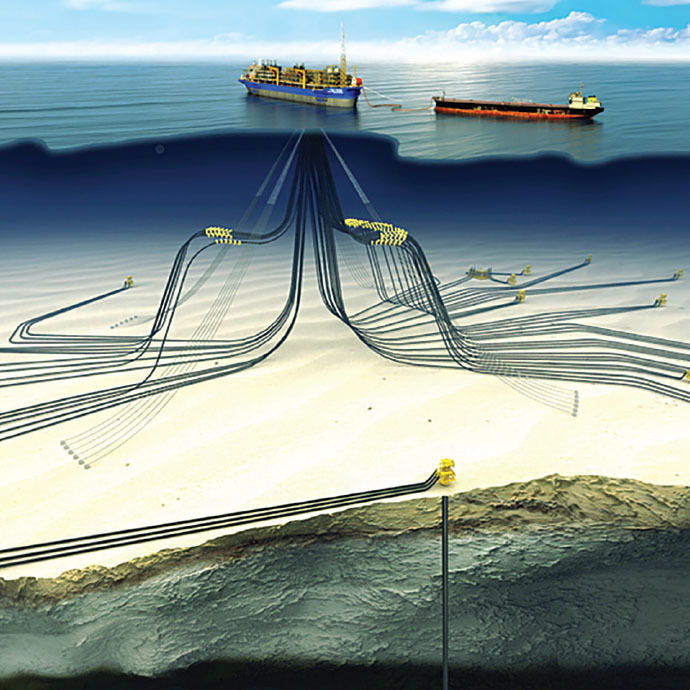 The subsea industry, particularly in Norway, has been moving toward all-electric controls for subsea production systems for some time, driven by ultra-long tiebacks. The all-electric design would avoid the need for long and costly hydraulic production control umbilicals and improve subsea control system reliability. 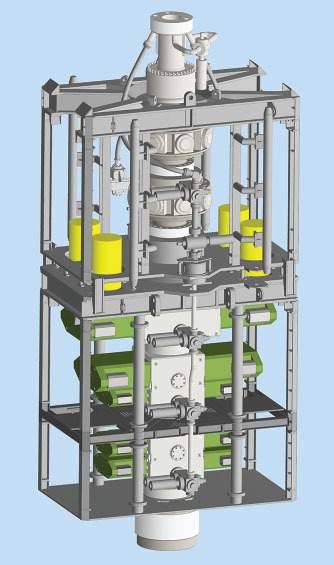 According to ESD, the benefits of an allelectric BOP system include high actuator force output; monitoring and control of applied force; no discharge of hydraulic fluid to the environment; improved redundancy; facilities for mechanical override; and increased reliability through system simplification with the elimination of critical error sources. Other benefits include reduced weight through removal of hydraulic equipment, and real-time monitoring of available back-up power using batteries instead of hydraulic accumulators. With regard to the technology partnership with MHWirth, ESD CEO John Dale said: "Today’s BOP technology is based on hydraulics, with disadvantages such as huge weight, high complexity with many sources of error, as well as challenges with regards to the external environment during operation and testing." Finn Amund Norbye, CEO of MHWirth, added: "Electro-mechanical operation of wellbarrier functions and connectors for BOPs is a revolutionary concept in the drilling industry and fits with today’s focus on safety and reliability, digitalization, providing continuous condition-based monitoring and preventive maintenance." Operators are also advancing their own well control and safety initiatives. Perhaps the most notable of these is being developed by Petrobras, which has launched its own campaign for new BOP technologies and well safety. Last year, the Brazilian state-owned company presented the results of its collaboration with Brazilian aerospace conglomerate Embraer S.A. on these topics with guest offshore operators and representatives of the International Association of Drilling Contractors. Among the innovations developed is an improvement to the SPM-type valve design, made by a BOP manufacturer. This is said to lead to increased reliability, ensuring fewer BOP failures, better operating safety, and reduced likelihood of project delays. Other results include improvements in the Safety Index calculations (the likelihood of completing the well phase without a BOP failure) and system reliability in drilling and completion activities; identifying the most critical component for increased BOP system reliability; and identifying opportunities and conceptual design developments for a new regulating valve, with a focus on reliability. Petrobras says it is looking to encourage industry participation in these initiatives and to establish others with similar objectives. Still other vendors are developing BOP testing tools. On this front, Samoco has introduced OneTrip, a new BOP testing tool that it developed in collaboration with Shell Offshore Engineering. The tool is said to enable operators to test a device’s variable bore rams and shearing capabilities in a single run, cutting trip time in half and achieving large cost savings. Until now, Samoco says that available tools were at most able to execute the pipe-ram and blind-ram subtests in a single run. The resulting round trip to the rig and back to complete the shear-ram subtest has meant an additional half-day or more of nonproductive time. And for tools that had to be pulled after each subtest, the NPT was even greater. 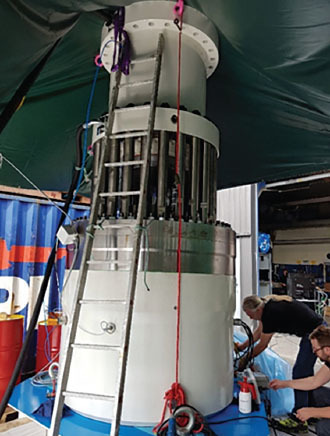 Further cost savings result from the tool’s high weight-bearing capacity compared with other subsea BOP test tools, which means less pipe is pulled from the hole to conduct the tests. Because the tool is verified to sustain loads of up to 1.2 MM lbs, in most cases only that length of pipe equivalent to the water depth needs to be pulled. In addition to direct cost savings, operators using the tool in development projects gain the value of booking production revenue sooner because of earlier well startups, Samoco says. 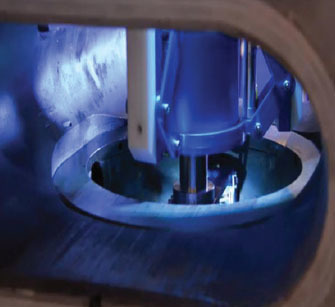 The key to its ability to perform all subtests in a single run is a patented design that allows the OneTrip tool to disconnect from the bottom tool assembly after testing the large and small rams and move up through the BOP cavity to test the shear rams. The low-torque, high-pressure design is said to ensure a resilient downhole seal that can withstand the harshest subsea conditions. Because the tool remains in the BOP the whole time, it is in position to repeat any subtest if needed. To advance the tool to commercial status, the company worked with Shell for approximately two years and proved the technology aboard the Stena IceMax deepwater rig, which was contracted to Shell in Canada offshore Nova Scotia.